Jacqui and Henry take a nap together. This entry was tagged sleep. Bookmark the permalink. First time I have seen a resemblance in them. Not being facetious either. I have to agree with you Trix, it’s the first thing that I noticed when I saw this picture. Doesn’t it bring back memories of when we used to sleep that peaceful? Precious picture Mark. Uh Oh, he is sleeping in the bed with you. Super cute sister, and super cute nephew. Thanks Mark. Only for naps Juj, only for naps. 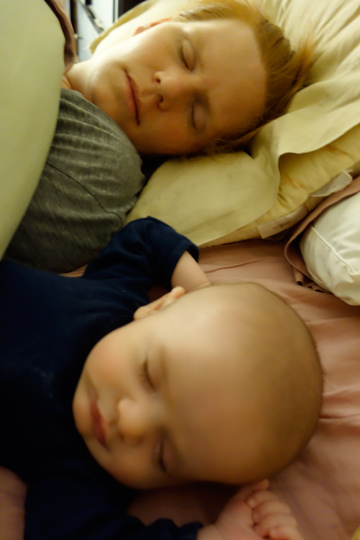 Naps are the gateway to co-sleeping Jackets, everyone knows this.